• Without a doubt the most exciting news is we increased the speed that pages load by a whopping 333%! 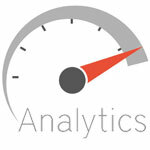 The next time you use Analytics you will notice that pages will load in just over a second. The improved performance has had a dramatic impact on the user experience. • Changes have been made to the Highlight Variance feature. Now the variance for current period and year to date are evaluated separately. So a current period positive variance will show in green and a year to date negative variance for the same category will be shown in red. • Saved reports have been enhanced to save and display the Highlight Variance and Filter options you chose when you added the report to your Saved Reports list. In addition to these changes we are currently working on giving you the ability to change the order your Saved Reports are listed in the Saved Reports menu. We hope that this new feature will be implemented within the next month.